Our latest submission from the mid-state is unique in that it involves how to help yourself get over a rough night rather than help you get started with one. I’m not a huge pomegranate fan, but Charlie’s concoction does sound like it would hit the spot after a long night. Looking forward to many more of his submissions – chicken salad on Cape Cod chips, anyone? From mixologist Charlie: Doesn’t get more basic than this. 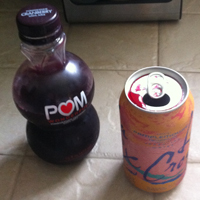 All you need is a can of La Croix (preferably grapefruit) and some of that POM pomegranate juice. The can is key, so no glass bottles. Pop open the can, pour a little bit of the La Croix out, a little POM in, and voila. If those instructions are too difficult for you, just follow ol’ Coach Buttermaker’s technique. Chased down with some BC Headache Powder, this is one of the better hangover cures I’ve found that doesn’t include alcohol…if you’re into that sort of thing. PWEEF!